Connect LiveChat with Segment to start chatting with your desktop and mobile visitors. Assign dedicated chat departments to specific pages and provide services that meet customer expectations. Segment is a customer data management and analytics software that helps companies to understand and manage customer data coming from multiple sources. The solution integrates with hundreds of other apps, pulling data from these sources into a single platform. It tracks interactions with your websites, mobiles devices, tablets, smartwatches, iBeacons, point-of-sale registers, and TVs. What's more, all your data can be accessed in Segment and automated to a schematized SQL database. You can use Amazon Redshift to analyze how users use your product, identify trends, understand revenue, and evaluate campaign performance. To make your data secure, Segment always stores a copy of your raw data so you can access it anytime. Plus, you can export your data to any of your existing, internal systems and apps. Integrate LiveChat with Segment and check out what type of device is most popular across your customers! Learn if they are more eager to visit your page from desktop or mobile and use this knowledge to create a better targeted campaigns! With the LiveChat plugin available straight in Segment marketplace, the process will take just a few minutes. And with our dedicated step-by-step tutorial, we will guide you throughout the whole process. If you run multiple websites and use LiveChat Groups to handle various pages by dedicated chat departments, you can easily assign particular groups to your pages. By add LiveChat to your websites with Segment, you can easily find out about visitor behavior. Analyze gathered knowledge and introduce changes that boost profits. Chat apps have become the most popular medium of communication. Thanks to LiveChat, you can adjust to ongoing changes and chat via a red-hot channel. LiveChat offers you a broad range of chat tools that take a fresh turn on agents’ work. Thanks to canned responses and message sneak-peeks, customer queries can be answered faster than ever before. Systematize all your chats using a tagging feature and never lose any vital contact again. 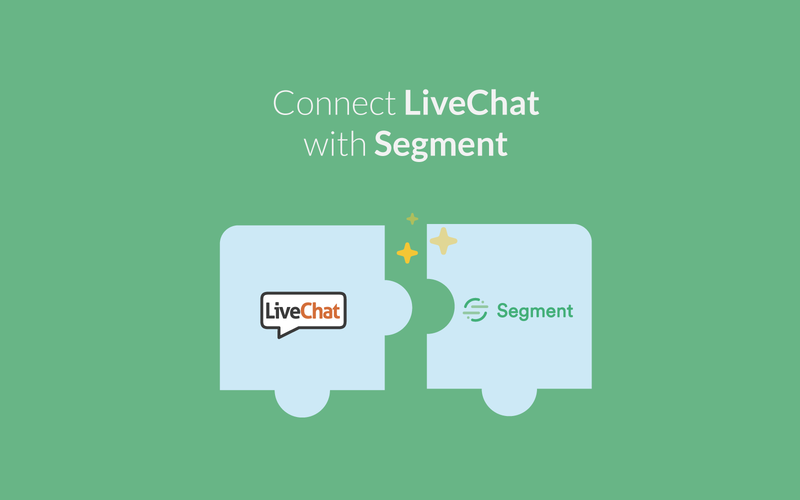 Start using LiveChat with Segment now!